What's the difference between jodhpurs and breeches? You’ve probably heard both of these words used to describe equestrian leg wear, but do you know actually know the difference between jodhpurs and breeches? Essentially, they’re both designed for riding and are usually made from a close-fitting, stretchy fabric, which moves with you when you're in the saddle or doing yard work. Both breeches and jodhpurs have reinforced patches on the inside of the knee area and some have a full seat. Jodhpurs and breeches are two fantastic pieces of equestrian clothing that are perfect for riding in. Often the words are used interchangeably, which makes it very confusing at times if you’re not sure of exactly what the difference is. Jodhpurs are usually made from a close-fitting, stretchy material. They have a full-length leg that reaches your ankle and often there’s a cuff that can be rolled up. They’re usually worn with short jodhpur or paddock boots, as they can be too bulky to wear inside long riding boots. The only real difference between the two is the point where they finish on your leg. Breeches are a little shorter than jodhpurs and are designed to finish mid-calf. Most modern designs have an elasticated cuff for a close, comfortable fit. Some have a touch and close fastening. This slightly shorter length eliminates any bulk around our ankle so you can comforatbly wear long boots. High-rise style breeches (designed to sit above your waist) made from a technical fabric for comfort, style and movment. They have an Ezi-Grip full seat for added security in the saddle. A close-fitting air panel cuff ensures there’s not bulk around the ankle so they fit comfortably inside your riding boots. 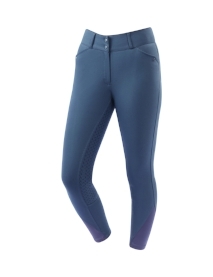 These breeches are available in charcoal, navy and navy plaid – perfect for everyday use, or in beige or white for competition. A great looking pair of full seat breeches, which are styled to sit just below your waist. The stretch material is durable for everyday riding and the full seat Daweoo stretch material gives a comfortable amount of grip in the saddle. The back pocket shape give a flattering and on trend finish. This particular style is available in navy only, but they’ll be a great additon to your everyday riding wardrobe. A classic looking pair of jodhpurs made from a 4-way stretch fabric for a great fit and shape retention. These breeches feature a contrast self-fabric contoured seat. You can chose from navy/turquoise, navy/pink, black/teal or black/grey depending on the rest of your riding wear. A perfect everyday knitted jodhpur with some eye-catching details just to make them a little different. Rear patch pockets with snap closure keep your possessions safe and secure whether you’re in or out of the saddle. Contrast coloured pocket trim adds a fun and eye-catching details. They’re available in two everyday colours; navy or petrol blue. Dublin Clothing celebrates 40 years!